Emirates celebrated the launch of three A380 destinations on 26 March, bringing its flagship three-class double-decker aircraft from Dubai to Tokyo-Narita, Casablanca and Sao Paulo on the same day. With this triple deployment, Emirates will be the first airline to operate scheduled A380 services in Latin America and to North Africa. 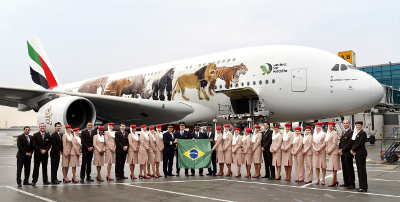 Moreover, the Emirates A380 service to Sao Paulo marks the airline’s 10th year of operations in Brazil, which began with daily flights between Dubai and Sao Paulo in October 2007. On all three routes, the A380 replaces an existing Boeing 777 service. Emirates’ spacious A380 aircraft can transport up to 515 passengers a flight and eight tonnes of cargo.